I've always loved those big, thick, crisp waffles that you buy from street carts in Brussels. I tried to make them for years, but sadly, mine always came out thin and soggy. I finally decided to tackle the problem, and I came up with these delicious yeasty Belgian waffles. You make them almost entirely the night before, so all you have to do in the morning is stir in some eggs and heat up the waffle iron. (You'll need a special Belgian waffle maker, but these are so good, they're worth having the extra piece of equipment around.) Because this batter rises overnight, the waffles are incredibly light and flavorful. I like to serve them piled high with sliced bananas, sprinkled with toasted coconut and drizzled with warm maple syrup. The night before, combine the water, yeast and sugar in a very large bowl (the batter will expand enormously). Allow it to stand for about 5 minutes, until the yeast dissolves and the mixture has started to foam, which tells you the yeast is active. Stir in the milk, butter, honey, vanilla and salt. Add the flour and whisk until the batter is smooth. Cover the bowl with plastic wrap and allow it to sit overnight at a cool room temperature. The next morning, heat a Belgian waffle iron according to the manufacturer's instructions and brush the top and bottom with melted butter. Beat the eggs together with the baking soda and whisk them into the batter until combined. Pour just enough of the batter onto the hot waffle iron to cover the grids (? to 1/2 cup each, depending on your waffle maker), close and cook for 5 to 6 minutes on medium heat, until the waffles are golden brown. Cut them apart with a small knife, if necessary, and remove them with a fork. Repeat the process until all of the batter has been used. 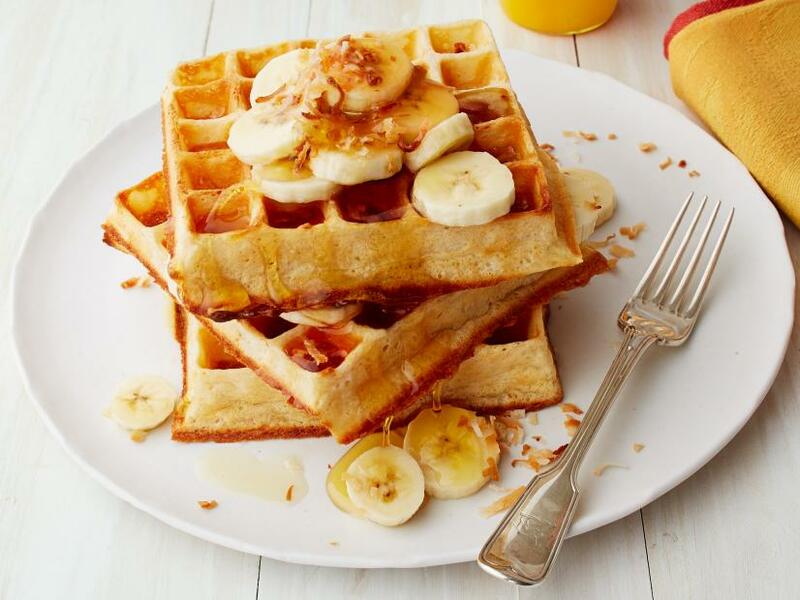 Serve the waffles hot with sliced bananas, toasted coconut, maple syrup and creme fraiche and let everyone help themselves. Prepare the batter the night before. 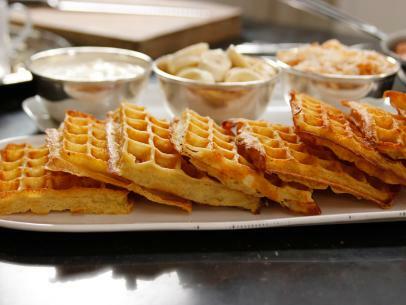 Cook the waffles up to 1 hour ahead and let sit on sheet pans at room temperature. Reheat for 10 minutes in a 350 degrees F oven, turning once.